"These pretty cookies are fairly labor intensive, but boy, are they worth it. 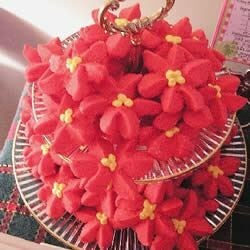 A few of these festive blossoms on top of my Christmas cookie trays really make a festive presentation." Preheat the oven to 350 degrees F (175 degrees C). Line baking sheets with aluminum foil or parchment paper. In a large bowl, cream together the butter, sugar and cream cheese until light and fluffy using an electric mixer. Add egg and vanilla; mix until well blended. Stir in flour by hand using a sturdy spoon while adding enough red food coloring to make the dough turn a pretty red color. Roll the balls in the red decorator sugar and place them on the prepared cookie sheets, spacing 1 inch apart. Refrigerate the cookies on their cookie sheets until firm, about 10 minutes. When the cookies are firm, make three slices across each cookie to make 6 slices like a pie, cutting only about 2/3 of the way through the cookie balls. Bake in the preheated oven for 10 to 12 minutes, until cookies appear dry. Cool on the cookie sheets, then peel away from the aluminum foil. Make the icing for the cookies by mixing the confectioners' sugar and water until it reaches a piping consistency. Add a drop of yellow food coloring. Put icing into a pastry bag or resealable bag and cut a small piece off of the corner. Pipe small dots onto the center of the cookies. Allow icing to dry before storing cookies in an airtight container at room temperature. Cookies can be stored for up to two weeks. Great Christmas recipe, except I used yellow M&m's in the middle instead of icing. Just push in center when cookies come out of oven. These were absolutely wonderful. I found that it was imperative to make the little cuts quickly after they came out of the fridge. That made it much easier to tug the little sections apart. I followed the directions exactly. They weren't easy to make, but they turned out beautifully. It was worth the work.